As the only female plastic surgeon with both private and NHS practices based in Derby, Miss O’Brien is uniquely placed to offer expert advice and support to all patients considering both surgery and non-surgical treatments. Miss O'Brien offers consultations and treatments at the superb facilities of Derby Private Health within the Royal Derby Hospital and the Nuffield Hospital Derby. It can be difficult to be sure that clinics and individuals offering cosmetic surgery are true experts in the field. Some providers use the term “Cosmetic Practitioner” without any specific training. 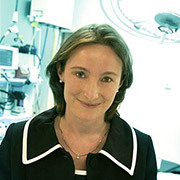 Miss O’Brien has wide-ranging experience and training in all aspects of plastic and reconstructive surgery. Her specialist registration with the General Medical Council is in Plastic Surgery. She is widely published in her field including her book Plastic & Hand Surgery - Classifications and Definitions in Clinical Practice. She has been involved for some years in research and teaching at a national level. This has included travel across Europe and to the Antipodes to speak at international surgical conferences. She started her plastic surgery training in Bristol before working at the Queen Victoria Hospital in East Grinstead, famous for its pioneering treatment of injured pilots from the Battle of Britain. She then completed her Higher Specialist Training in Plastic and Reconstructive Surgery in the West Midlands where she was involved in the treatment and rehabilitation of soldiers from Iraq and Afghanistan. She has a degree in Medical Law & Ethics from Glasgow University where her dissertation addressed the issue of ethical plastic and cosmetic surgery. Miss O’Brien now works at the Royal Derby Hospital, spending time in both the internationally renowned Pulvertaft Hand Centre and as Clinical Lead for the new Royal Derby Cosmetic Surgery Service. She has a weekly clinic at Loughborough Hospital, where she often advises and treats high level competitive athletes. She is also available for consultations at the Nuffield Hospital in Derby. She has recently been featured on BBC Radio Derby with Aleena Naylor and has been interviewed by BBC East Midlands Today and Capital FM as Clinical Lead for the Royal Derby Cosmetic Surgery Service. She is also available for consultations at the Nuffield Hospital in Derby. Look out for her Cosmetic Surgery information evenings at both the Royal Derby Hospital and Nuffield Hospital in Derby. These offer an informal introduction to the possibilities of plastic, hand and cosmetic surgery and are both free and entirely without obligation. She is ideally placed to offer expert advice on the benefits and risks of plastic surgery and recognises that some women considering surgery may find it easier to talk to a female surgeon. Miss O’Brien is fully aware that any choice about cosmetic surgery is “a big decision” and is always keen to discuss all aspects of any procedure in detail with individual patients. Contact Miss Mary O’Brien for more information on Cosmetic or Hand Surgery. © 2011 Copyright Mary O’Brien. All rights reserved. Designed and maintained by Max Design Studio Ltd.